Tonight for #undeadOctober, we decided to go for another one that we had not see yet. Our streak have been going to well that we thought we could risk it again. This time, however, we got a dud. I am not even sure why it has the high reviews that it does on both Netflix and IMDB. The worst part was that there were just not enough zombies so it will be hard to do my zombie review at all. The movie didn't start out horrible and it really never did get worse. The problem was that it didn't get any better either. It just kept a slow pace as the grave digger slowly told his stories about digging up dead and undead. What it amounted to was them digging up bodies, them digging up a vampire/zombie thing, them digging up an alien, and them digging up zombies. That about sums up the whole thing really. Near the end, they open up a crate that only has the foot of a zombie and I felt that it was a good representation of how I felt watching the movie. Might as well just get to the zombie review because I can't think of anything else to say. The zombies were completely unexplained in almost every aspect. We didn't know how they were created, how they could be killed, how intelligent they were, or even what they were used for after they were dug up. 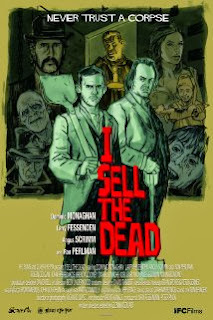 As far as using this movie for my zombie research, I was unable to gain anything useful or interesting from this one. Speed of Zombie: Floating, teleporting, or crazy slow? Not totally sure if everything was actually a zombie. The fast one might have been some kind of crappy vampire (not the sparkly kind). Keep checking back because we still have a long way to go. If we are lucky this will be the worst one and we will only get better from here.